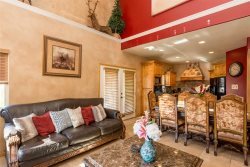 This is an amazing one of a kind moose hollow condo! Beautifully decorated, looks and feels like a model home, yet incredibly comfortable with leather sofas, top of the line beds and linens and gourmet kitchen. Spectacular mountain views from the front balcony and back patio! Located at the end of the second fairway of the Wolf Creek Golf Course. There are 4 flat screen tv's (one set up in every bedroom with dish TV plus the main level living area). Make this your home away from home at the beautiful wolf creek resort. We're also offering complementary internet WIFI. There are two Master Suites with KING SIZE bed and the other is a QUEEN SIZED bed and their own private baths! There is another guest bedroom with a queen size bed and it's own bathroom! There is a Queen sleeper sofa up on the main floor so the unit can easily accommodate 8 guests! There are 3 full bathrooms and one half bath! The unit has a gourmet kitchen with granite counter tops, stainless steel appliances and seating for 8 as well as a private gas grill on the back patio for year round grilling! This unit has radiant heated floors on the lower level, great for those cold winter nights! Located minutes from powder mountain ski resort, Snowbasin ski resort and Nordic Valley ski resort. This is a skier's dream. The shuttle stop for easy transportation to Powder Mountain is literally steps from the unit. Enjoy all the comforts of home while vacationing in paradise! There is a sleeper sofa in the family room! It is a Queen sized bed. Bathrooms: 3 1/2 Bathrooms, 1 Half Bath main floor. This condo was perfect! Thank you very much. Really enjoyed it. That place is really well equipped, and Im looking forward to a return trip.